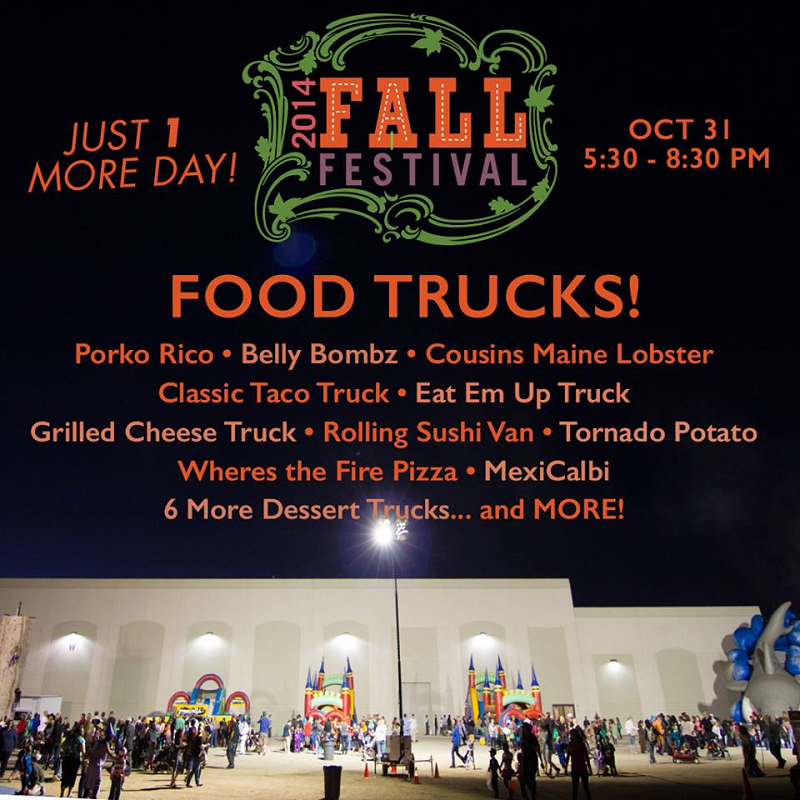 Sixteen food trucks, are scheduled to be part of the church’s Fall Festival, which is set for 5:30 to 8:30 p.m. tonight (October 31). 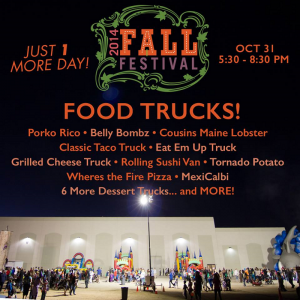 Scheduled trucks include Belly Bombz, Classic Taco Truck, Cousins Maine Lobster, the Cupcake Place, Eat ‘Em Up Truck, the Grilled Cheese Truck, Kona Ice, MexiCalbi, Porko Rico BBQ, Rita’s Italian Ice and Frozen Custard, Rolling Sushi Van, the Sweet Stop, Tornado Potato and Where’s the Fire Gourmet Pizza. The Grove Community Church is at 19900 Grove Community Drive. For more information on this free event, click here. For those of you here in the Inland Empire who haven’t yet experienced Dunkin’ Donuts, you’ll have your chance soon enough. The chain is opening a location — one of about 60 planned for Southern California — in Upland. 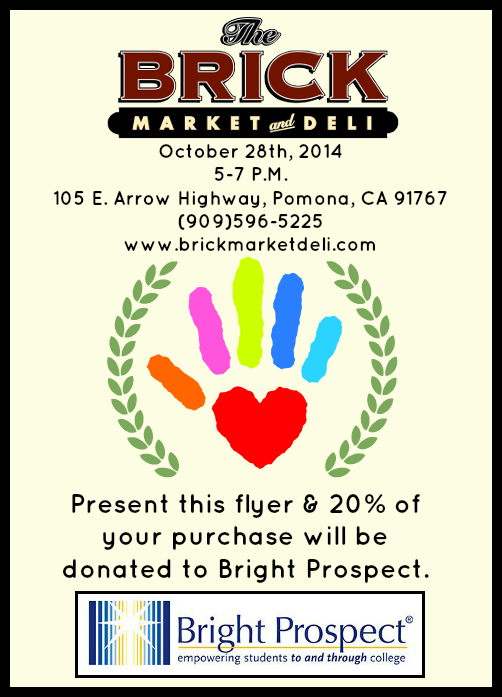 Pomona’s The Brick Market and Deli is hosting a fundraiser for Bright Prospect from 5 to 7 p.m. tonight (October 28). Bright Prospect is an organization which has a goal is to increase college-going rates among underserved populations across the nation. 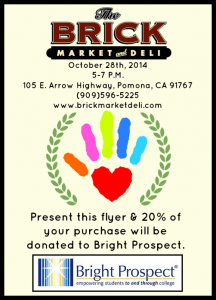 To participate, simply print this flier and present it when you order and the Brick will donate 20% of your bill to Bright Prospect. The Brick Market and Deli is at 105 E. Arrow Highway. 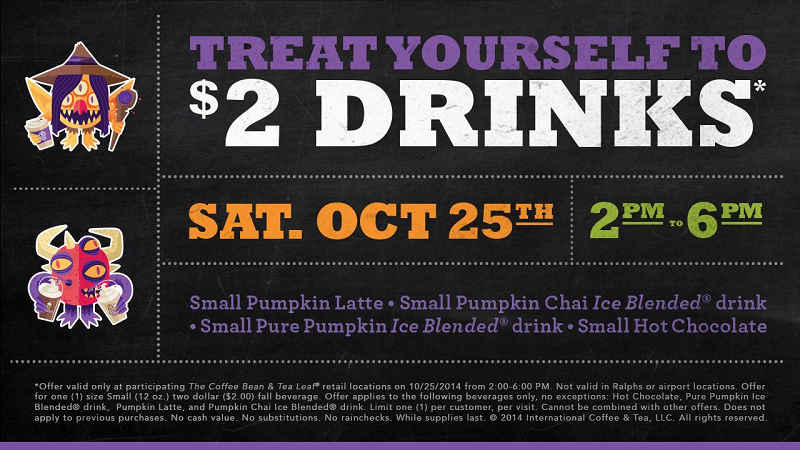 Drop by your local Coffee Bean & Tea Leaf between 2 and 6 p.m. today (October 25) and you can pick up a taste of fall flavor for less. 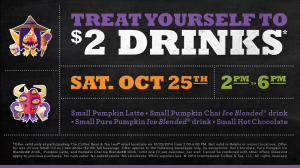 The coffeehouse will be offering select 12-ounce fall beverages for just $2. Guests can choose from a Pumpkin Latte, a Pure Pumpkin Ice Blended, a Pumpkin Chai Ice Blended, or Hot Chocolate. Yes, corn ice cream is a thing. So is avocado ice cream. Spinach, too. And thanks to KTLA’s Chris Burrous — who brought Fontana’s 13 Ice Cream onto our radar when he mentioned that he recently filmed a segment there — we’ve tried them all. In the past, we’ve mentioned the popular (and usually sold-out) Scotch whisky classes at Vom Fass in Claremont. Well, next month the shop is upping the ante. Scotch Master Stewart Laing will be visiting from Glasgow, Scotland, and spending two days at the shop conducting Scotch seminars and a teaching a Scotch class. Laing has almost 50 years experience in the whisky business and recently started his own company — Hunter Laing & Co. Ltd. — with his two sons. 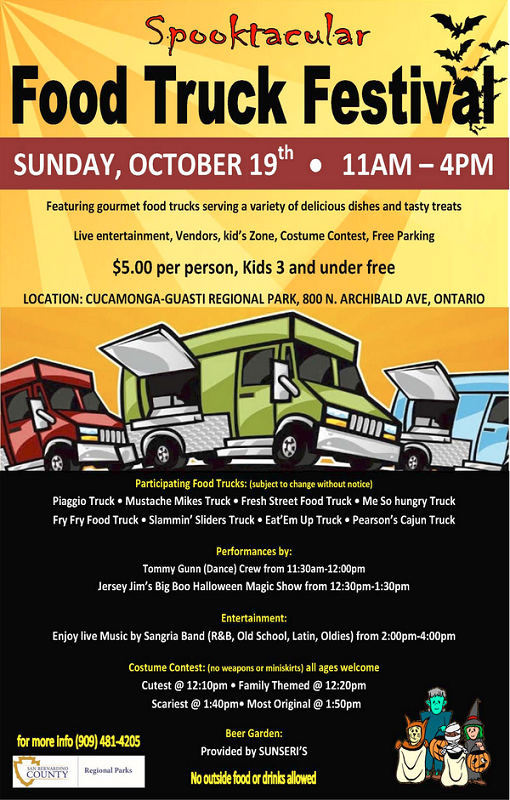 Cucamonga-Guasti Regional Park (800 N. Archibald Ave., Ontario) is hosting a “Spooktacular” food truck festival from 11 a.m. to 4 p.m. tomorrow (October 19). It’s the park’s third such fest in the last few months. 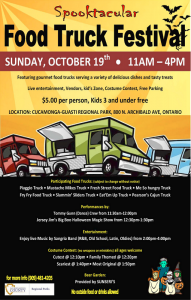 Participating trucks include: Eat ‘Em Up Truck, Fresh Street Food Truck, Me So Hungry, Mustache Mike’s Italian Ice, Pearson’s Cajun Food, Piaggio on Wheels and Slammin’ Sliders. The event will also feature live entertainment and a costume contest. Admission is $5 per person, with children age 3 and under admitted free. 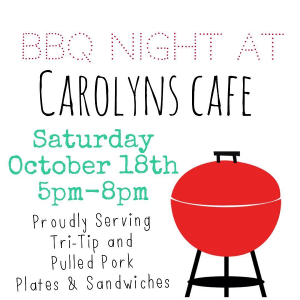 Carolyn’s Cafe in Redlands — usually only open until 2 p.m. — is hosting its first BBQ Night from 5 to 8 p.m. tomorrow (October 18). Tri-tip and pulled pork sandwiches and plates will be available, plus your choice of ranchero beans, cole slaw or fries for sides. 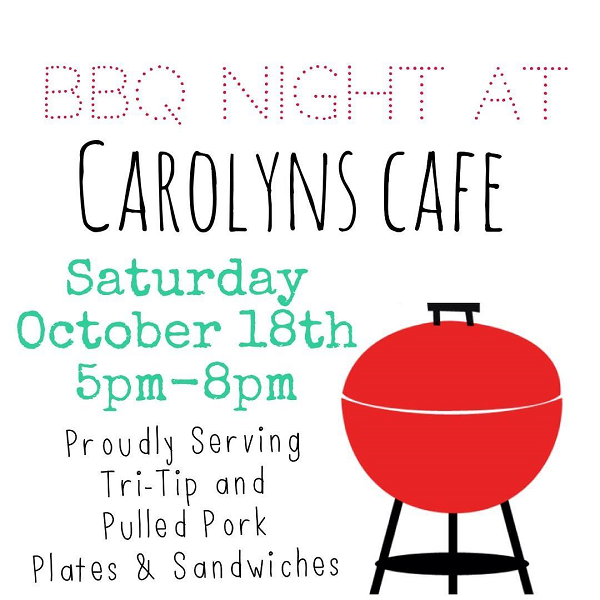 And it wouldn’t be Carolyn’s without their famous coffee cake — or chocolate chip crumb cake, if you prefer — for dessert. 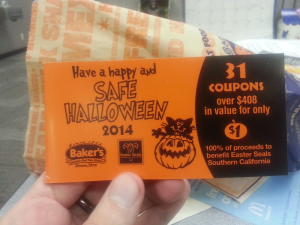 Carolyn’s is at 1711 W. Lugonia Ave.
It’s time for Baker’s Drive-Thru’s Safe Halloween coupon fundraiser! 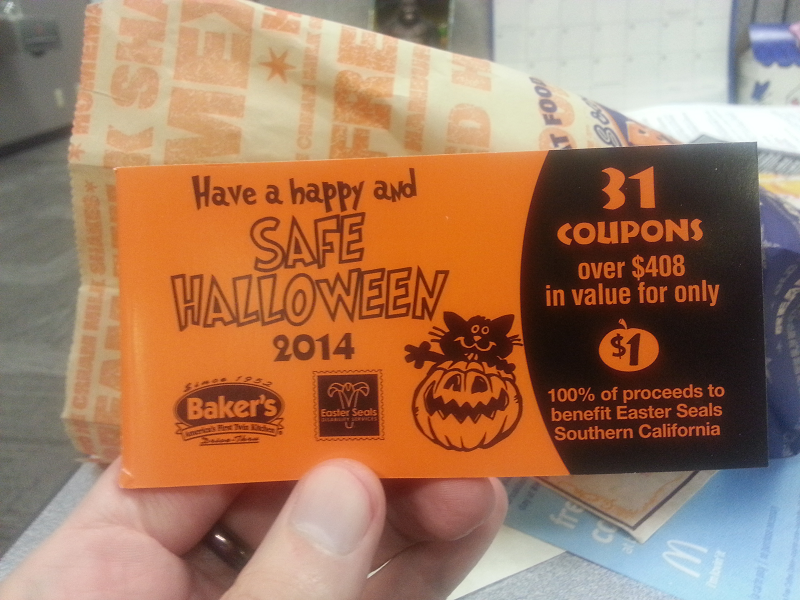 October marks the return of one of our favorite fundraisers: The Baker’s Drive-Thru Safe Halloween coupon books. This year’s book includes 31 coupons representing $408 in savings. The coupons are perfect for handing out to trick-or-treaters or — if you’re like me — treating yourself, family and friends to free and discounted food and fun. The deals start with three coupons for free food from Baker’s Drive-Thru: a bean and cheese burrito; egg soft taco; and French fries, hash browns or chips and salsa. There are also coupons for free child’s admission to the Aquarium of the Pacific, the Planes of Fame air museum, the Ontario Reign and both Scandia’s and the Friends of C.I.D.’s haunted houses. There are several free passes for Fiesta Village and coupons for free miniature golf at Monarch Fun Zone as well as free bowling at Del Rosa Lanes and Victor Bowl. Have a sweet tooth? There are coupons for a free mini cupcake at My Delight Cupcakery and a free donut from Krispy Kreme. The coupons books are just $1 and 100% of that goes to Easter Seals Southern California. The books are available at all Baker’s Drive-Thru locations while supplies last. Inland Empire foodies rejoice: Inland Empire Restaurant Week is back and it’s twice as big. 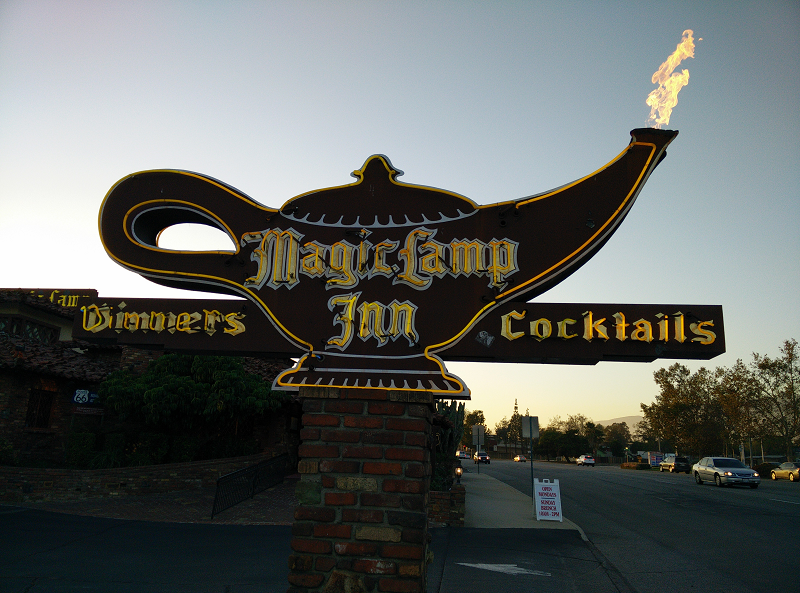 The folks at the Greater Ontario Convention and Visitors Bureau have been hard at work and have enticed 116 122 restaurants to participate — almost more than double the 60 that participated in the inaugural event this spring.